Today Jeff Flake announced his retirement with a withering blast at Señor Trumpanzee. ""We must stop pretending that the conduct of some in our executive branch are normal. They are not normal... It is time for our complicity and our accommodation of the unacceptable to end. In this century, a new phrase to describe the accommodation of a new and undesirable order, that phrase being the new normal. That we must never adjust to the present coarseness of our national dialogue with the tone set up at the top. We must never regard as normal the regular and casual undermining of our democratic norms and ideals, we must never meekly accept the daily sundering of our country. The personal attacks, the threats against principles, freedoms and institution the flagrant disregard for truth and decency. The reckless provocations, most often for the pettiest and most personal reasons, reasons having nothing whatsoever to do with the fortunes of the people that we have been elected to serve. None of these appalling features of our current politics should ever be regarded as normal. We must never allow ourselves to lapse into thinking that that is just the way things are now. If we simply become inured to this condition, thinking that it’s just politics as usual, then heaven help us. Without fear of the consequences and without consideration of the rules of what is politically safe or palatable, we must stop pretending that the degradation of our politics and the conduct of some in our executive branch are normal. They are not normal. Reckless, outrageous and undignified behavior has become excused and countenanced as telling it like it is when it is actually just reckless, outrageous and undignified. And when such behavior emanates from the top of our government, it is something else. It is dangerous to a democracy. Such behavior does not project strength because our strength comes from our values. It instead projects a corruption of the spirit and weakness. It is often said that children are watching. Well, they are. And what are we going to do about that? When the next generation asks us, why didn’t you do something? Why didn’t you speak up? What are we going to say?" Listen to the whole incredible speech above. John McCormack's look at what would have been Flake's grim-- but brave-- march towards likely defeat in the Arizona Republican primary for the Weekly Standard raised a very crucial question for our politics: "How much room is there in the GOP to criticize Donald Trump and to what extent is the party transforming itself into a cult of personality?" McCormack asked Flake "if there’s a point at which the Republican party will no longer be worth it. How many Kelli Wards and Roy Moores can it nominate before it’s time to start thinking about a new party? 'I don’t know,' Flake says. 'We’re not there yet.'" Republican voters in Arizona are unlikely to give Flake much choice. Every recent poll shows him losing to far right crackpot and fringe Bannon character Kelli Ward. 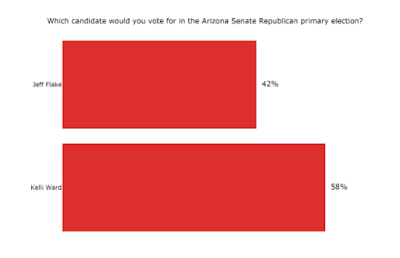 The most recent poll, by Google Consumer Surveys, shows Ward with 58% of GOP primary voters and Flake at 42%. It's his best showing all year-- and his only one that breaks out of the 20s and 30s. He's have a better shot in the general election, where Schumer has chosen Kyrsten Sinema to run. She has the worst voting record of any Democrat in the House and her ethics-free career is all about endemic corruption. 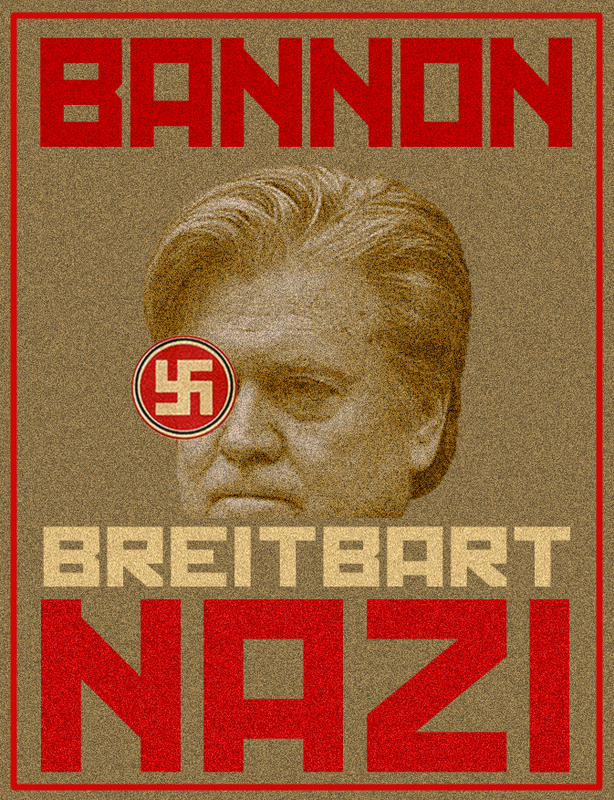 At Ward's kickoff event in Scottsdale last week, Bannon told the crowd that "There’s a revolt going on from Alabama to Arizona. This movement is working-class and middle-class people standing up against a permanent political class of global elitists." Ward, who has wrapped herself in the Trumpist mantle, said she would make Arizona and America great again by serving in the Senate "as a conservative, as a populist, as an Americanist, as a scurrilous nationalist," a disparaging reference to John McCain denouncing "spurious nationalism" in a speech the day before. Clinging to Trump is a decent primary strategy for Ward but a risky general election move. Now the Arizona Republican Party will insert a more establishment figure in Flake's stead. Trump didn't even crack 50% in last year's presidential election. McCain and Romney had each scored 54% against Obama. Trump won but his margin was weak-- 1,252,401 (49.0%) to 1,161,167 (45.4%). The best shot for Ward general election would would come if the Democratic base figures out what a piece of crap Schumer is shoving down their throats. But can Ward's campaign criticize Sinema for being Republican-lite and for voting with Trump and Ryan too frequently? As for Flake, it would have been hard to have imagined him coming back from his low poll numbers to overcome Trump's animosity. Most Republican voters in Arizona like Trump... and hate Flake for criticizing him. DeMint’s insurgency was best summed up by his comment before the 2010 midterm elections that he’d “rather have 40 Marco Rubios than 60 Arlen Specters” in the Senate. (Specter, a liberal Republican till then, had joined the Democratic party in 2009 rather than face a conservative challenger.) “If you want 60 Republicans, you’ve got to have at least 40 to start with who stand on principle,” DeMint explained. But the insurgents of 2010 are now the elitist establishmentarians of 2017. At least that’s how it appears to the likes of Steve Bannon, who thinks Flake, particularly in his criticism of President Trump, is standing on the wrong principles. The Bannon motto seems to be that he’d rather have 40 Kelli Wards than 60 Jeff Flakes in the Senate. ...[I]f you spend a few minutes talking to Flake or reading his August book, Conscience of a Conservative, it’s clear Flake has no interest in winning reelection by pretending to be someone he’s not. When I ask him after the tech summit on October 12 whether immigration reduces the wages of some Americans, Flake is blunt: “We need more robust legal immigration, and we need significant temporary worker programs, more than we have, to account for the labor shortages that we have, particularly in the high-tech area.” He writes in his book that he remains “very proud” of his participation in the Gang of Eight immigration reform bill that passed the Senate in 2013, divided the Republican party, and died in the House. ...In Trump’s first meeting with congressional Republicans after wrapping up the GOP nomination in 2016, he immediately recognized Flake. “You’ve been very critical of me,” Trump said, according to Flake. “Yes, I’m the other senator from Arizona-- the one who didn’t get captured-- and I want to talk to you about statements like that,” Flake replied, before asking about Trump’s comment that Mexico was sending rapists to the United States. Flake writes that Trump brushed off the question and told Flake he was going to lose reelection. “I had to inform him that I wasn’t on the fall ballot,” Flake writes. Trump may have just been off by two years. The Arizona Republic's Dan Nowicki was treating Ward as the primary front-runner in his report on the race last week. That's going to change very quickly. "Ward's standing with the right has been bolstered by Steve Bannon," he wrote, but points out that she's so extreme and fringy that "she could help deliver the Senate seat to the Democrats in the general election. Because of that possible scenario, Ward is drawing comparisons to past conservative 'tea party' challengers such as Sharron Angle of Nevada, Christine O'Donnell of Delaware, Todd Akin of Missouri and Richard Mourdock of Indiana, who won Senate primaries but lost seats that more moderate Republicans might have been able to win." Arizona GOP operatives see her as a conspiracy theory nut, a "nightmare candidate" and "a sure loser." Sabato's Crystal Ball refers to her as "Christine O'Donnell and Sharron Angle and Todd Akin all wrapped into one." Flake: "There are hinges of history that happen, I hope we're nearing that, I hope there are enough people that will stand up, and I think as elected leaders it's our responsibility to do that." And the American fascist movement celebrated today. 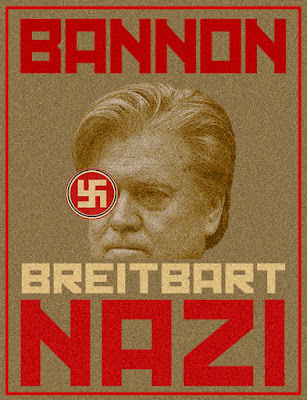 Bannon crowed, thinking about his own hinge of history: "Our movement will defeat you in primaries or force you to retire. The days of establishment Republicans who oppose the people's America First agenda are numbered." Flake was "normal" awful. The incoming cabal are Nazis. If R voters are eschewing their "normal" awful for Nazis, that points out that the evIlution is inevitable. Only in the usa, right? the cowardice of democrats and Carter in letting Reagan's treason slide (to be fair, the precedent was set by LBJ letting Nixon's almost identical treason slide in '68). Nixon started with his naked appeal to southern racists, and it worked, and it was not addressed either by democrats or society as a whole. By the time Reagan appealed to them, they were the biggest single demo in the R party. Now, they are the ONLY non-billionaire demo they have. But because nobody and nothing addressed it in 50 years, they've flowered and mushroomed and become the INEVITABLE future of the usa. Our "Christian" society now plots and plans to kill millions of (mostly) nonwhites in order to grant billionaires access to trillions more in free money. It gives the greedy more and it kills those the voting demo hates. Our democratic society has not had a straight election at least since 2000, both primary and general, while we still sanctimoniously whine about the verifiably more democratic elections elsewhere (when they don't elect the one we wanted). And there is the $22 trillion debt that will be $28 T by the time trump wins re-election. Flake is/was Nixon bad. But the usa needs to become Nazi Germany bad. it's inevitable. Just like Germany, because nobody and nothing stopped it.